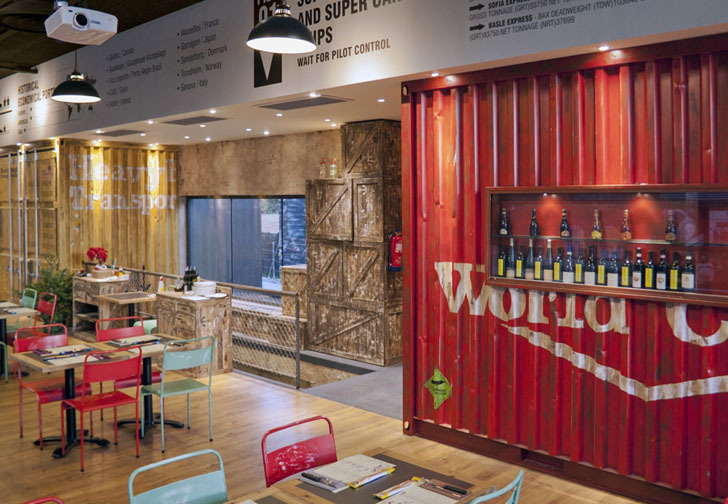 Architect Pedro Scattarella has transformed everyday materials used in shipping and packaging into a rustic and inventive interior for a pizzeria in Barcelona. Los Sopranos restaurant is made up of shipping containers, reconstructed freight boxes and packing crates. The subtle hues of the shipping materials are offset with brightly colored chairs, and bold red tiling leading to the restaurant’s brick oven. 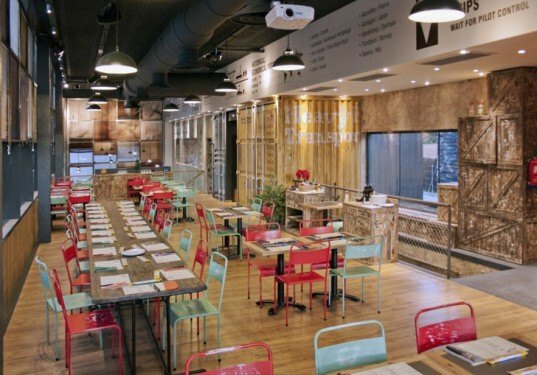 The front of the pizzeria is an open kitchen, set behind a glass curtain, with the idea that passersby and customers can watch their pizza being made from scratch. Beyond the kitchen and counter area of the restaurant is a double-height dining room on the second floor mezzanine which overlooks the kitchen. The dining room is lined from end to end with upcycled shipping materials, forming each wall. A bright red shipping container greets guests at the top of the stairs, with a shelf for a beverage display built into the side. Pale yellow and blue shipping containers section off other areas of the dining room, creating bathrooms, private dining and storage areas. Wooden packing crates have been joined together to make shelving for oils, napkins and spices. Smaller corrugated shipping containers have been converted into shelving to hold the restaurant’s glasses and flat ware, easily accessible to the wait staff. Giant storage signs have also been hammered out to line walls, both downstairs and leading up the staircase. The dining room is laid out in mostly communal dining, with one long rustic table on one side, joined by green and red chairs. The entire interior was inspired by the harbour warehouses of New York City. The reclaimed wooden crates evoke a wharf feel, and give customers a historic narrative to contemplate while they devour their savory pizzas. The interior design project The Sopranos has been a big success. Francisco Segarra,firm of furniture and decoration , has supplied some of the furniture such as chairs, tables and furniture lake container type. It was published in the magazine Proyecto Contract , in Spain. You can see it in www.franciscosegarra.com. Best regards. Thanks for your work. Shipment containers, perhaps que quickest way to solve chronic world housing shortage. The front of the pizzeria is an open kitchen, set behind a glass curtain, with the idea that passersby and customers can watch their pizza being made from scratch. Beyond the kitchen and counter area of the restaurant is the double-height dining room on the second floor mezzanine which overlooks the kitchen and double height covered with mis-matched shades. The dining room is lined from end to end with upcycled shipping materials, forming each wall. A bright red shipping container greets guests at the top of the stairs, with a shelf for a beverage display built into the side. Pale yellow and blue shipping containers section off other areas of the dining room, creating bathrooms, private dining and storage areas. Wooden packing crates have been joined together to make shelving for oils, napkins and spices. The entire interior was inspired by harbour warehouses of New York City. The reclaimed wooden crates evoke a wharf feel, and give customers a historic narrative to contemplate while they devour their savory pizzas.